If you like the Crunchwrap Supreme from a local fast food chain, then you’ll absolutely love this Tasty 7 Layer Quesadilla Wrap. While it’s somewhat of a copycat, it’s so much better. 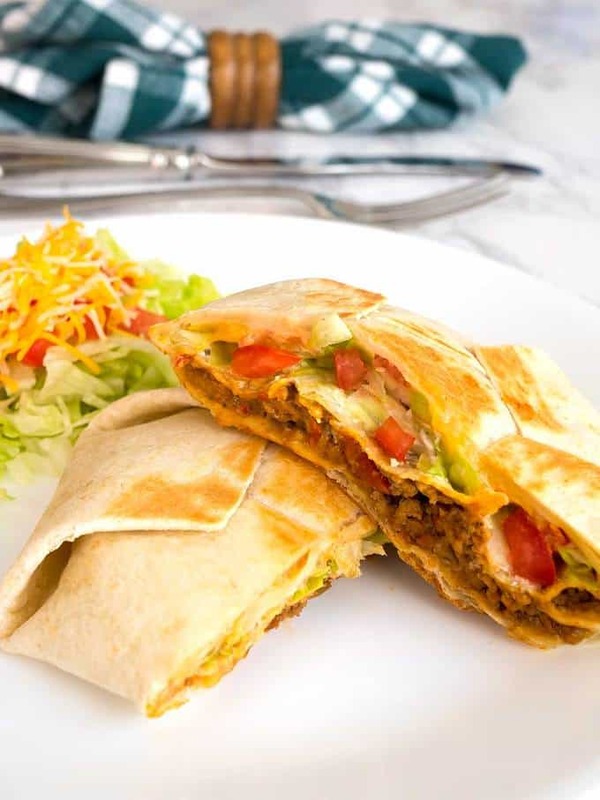 Tasty 7 Layer Quesadilla Wrap is not at all doughy, and you can actually taste the yummy ingredients! 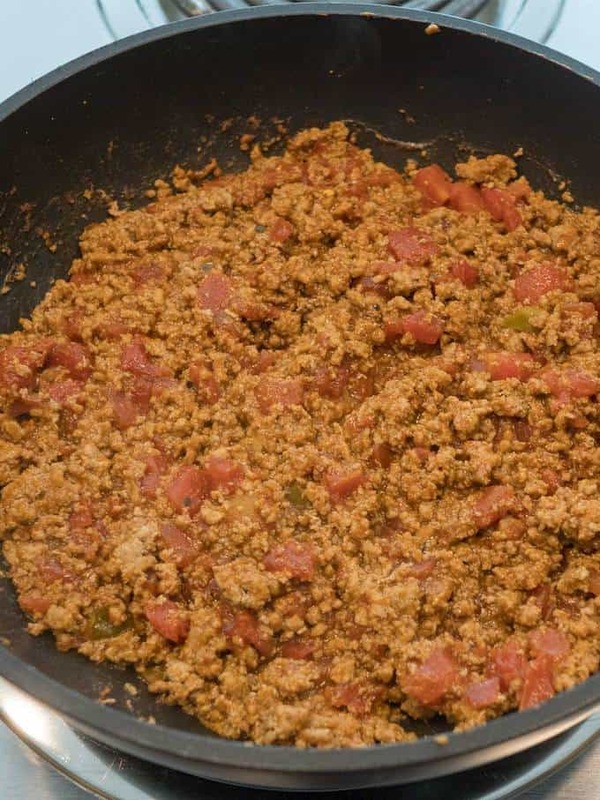 I used the following ingredients for the meat filling: Lean ground turkey, DIY Taco Seasoning, Rotel Original Diced Tomatoes and Green Chilies, and water. You could certainly use store-bought taco seasoning. However, making your own is super easy. In addition, it’s so much better and you know exactly what’s in it. 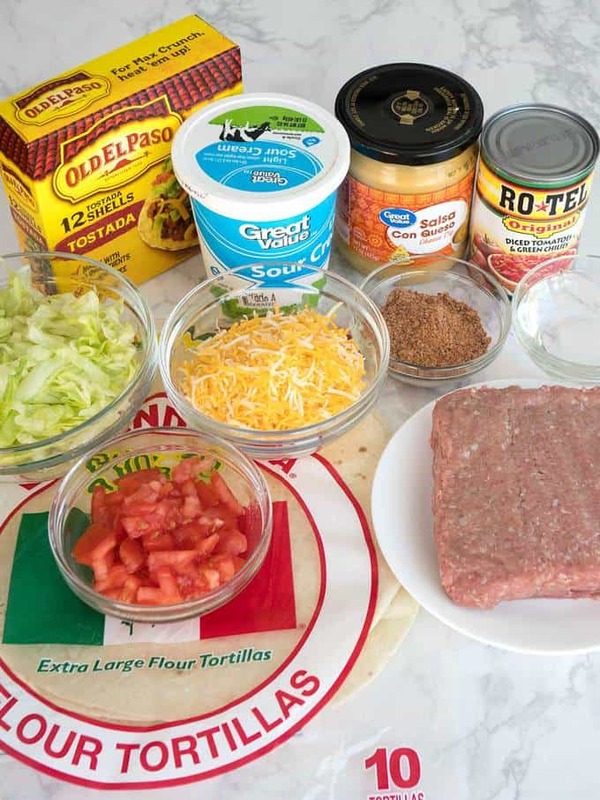 For the Tasty 7 Layer Quesadilla Wrap, I used extra-large flour tortillas, Salsa Con Queso Cheese Dip, meat filling, Tostada Shells, light sour cream, shredded lettuce, diced tomatoes, and shredded mexican cheese blend. I started by browning the ground turkey in a 10-inch skillet over medium heat. I tend to always use ground turkey instead of ground beef for several reasons. First, it’s way more tender. Second, it’s not as fatty. Finally, the seasonings provide the flavor, so you’ll never know that it’s not beef! Once the meat was browned, I drained it in a colander, and ran hot water over it. I always do this to remove as much fat as possible. Then, I drained the ground turkey, and rubbed it between my hands to break it up into small pieces as I returned it to the pan. Next, I added the taco seasoning, water, and Rotel Tomatoes. I stirred the mixture to combine everything, and cooked it uncovered over medium heat for about 10 minutes. After 10 minutes, most of the liquid had evaporated. First, I cut a circle about the size of a tostada shell from one of the flour tortillas. This will serve as the “top” before I wrap the flour tortilla. Before wrapping the tortilla, I topped the 7 layers with the small tortilla circle that I had previously cut out. Then, I wrapped the tortilla around the filling in a hexagon shape. I heated a 12-inch nonstick skillet over medium heat. Then, I added the wrapped quesadilla, seam-side down. I cooked it for about 3 minutes until it started to brown. Next, I flipped the wrapped quesadilla over and cooked it for another 3 minutes or so until the other side started to brown. Talk about good! The Tasty 7 Layer Quesadilla had the perfect amount of each of the fillings. It was a bit spicy, and absolutely delicious. Yum! If you like the Crunchwrap Supreme from a local fast food chain, then you'll absolutely love this Tasty 7 Layer Quesadilla Wrap. While it's somewhat of a copycat, it's so much better. 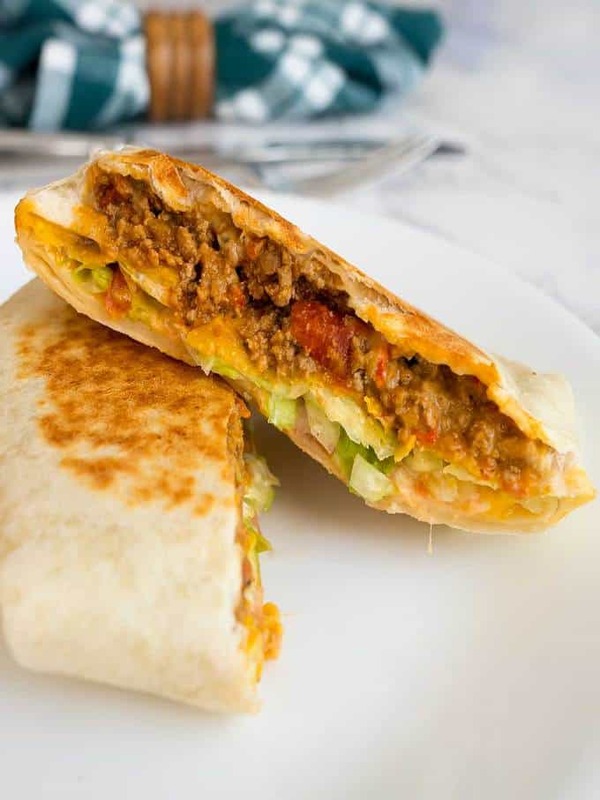 Tasty 7 Layer Quesadilla Wrap is not at all doughy, and you can actually taste the yummy ingredients! QuesadillaBrown ground turkey in 10-inch nonstick skillet over medium heat, breaking up into small pieces. Transfer to colander; run under hot water to remove as much fat as possible. Drain completely. Wipe skillet with paper towel. 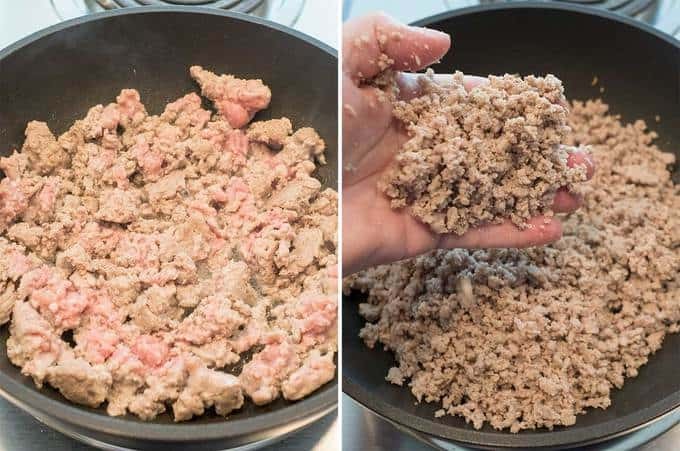 Return browned ground turkey to skillet by rubbing between hands to break up into small pieces. Add taco seasoning, water, and Rotel tomatoes. Stir to combine. Cook uncovered over medium heat for 10 minutes, or until most of the liquid has evaporated. Allow to cool. 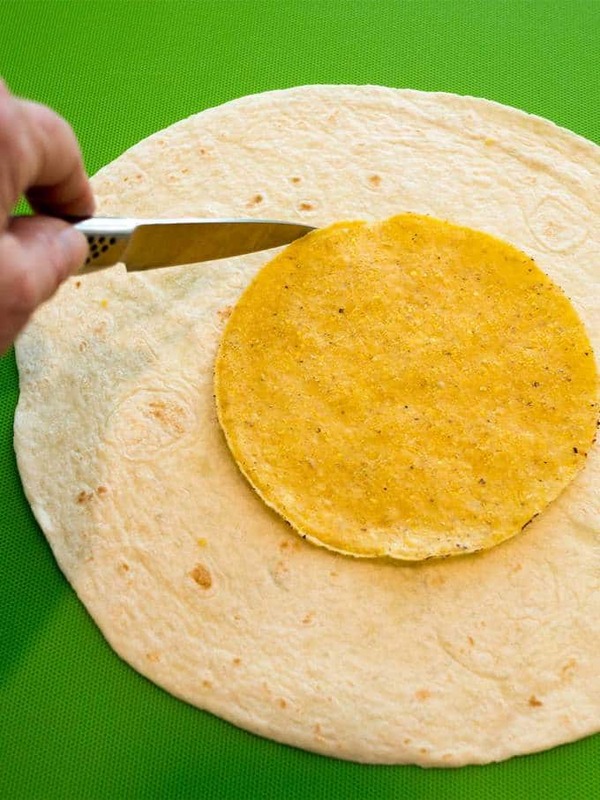 Place tostado shell on flour tortilla, and cut flour tortilla circle the same size as tostado shell. Set aside. Place flour tortilla on work surface. Spread 2 tablespoons cheese dip in 6-inch circle in middle. Add 1/2 cup of meat filling and spread over cheese dip. Place one tostado shell on top of meat filling. Spread 1 tablespoon sour cream on tostado shell. Add 2 to 3 tablespoons shredded lettuce, 1-1/2 teaspoons diced tomatoes, and 2 to 3 tablespoons shredded Mexican cheese blend. Top with reserved 6-inch tortilla. 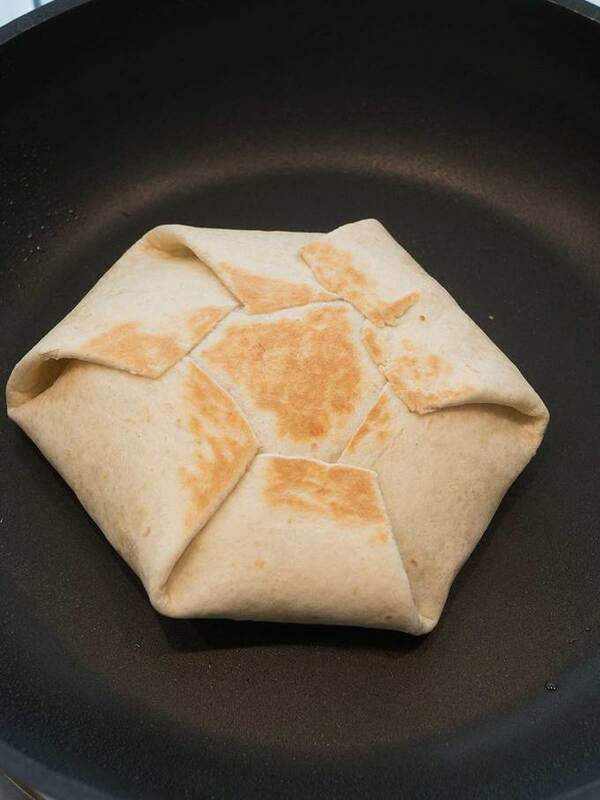 Fold large tortilla around filling in hexagon shape. Heat 12-inch nonstick skillet over medium heat. 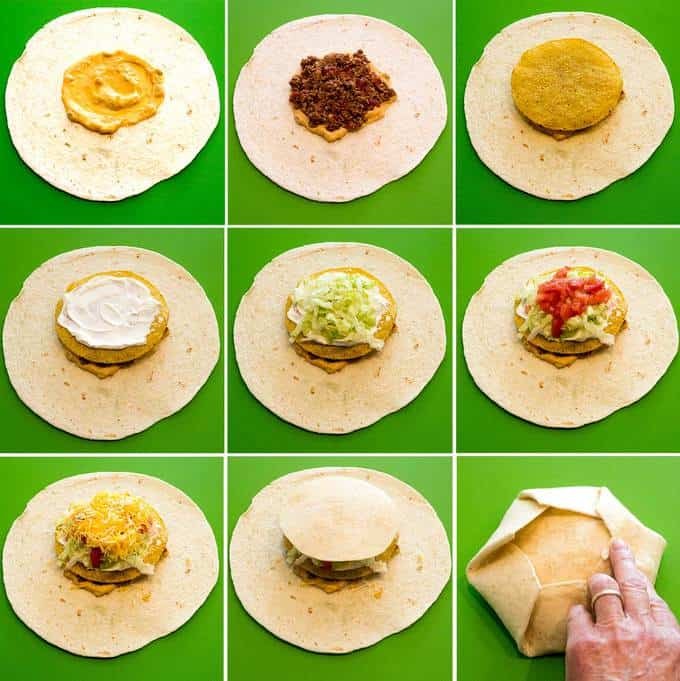 Add quesadilla wrap, seam side down. Cook for 3 minutes, or until lightly browned. Turn and cook 3 more minutes or until other side is lightly browned. Repeat with remaining flour tortillas and filling. Yield: 6 Tasty 7-Layer Quesadilla Wraps.